Real Foods, online health food retailer, sent me this Supernature cold pressed lemongrass infused rapeseed oil to try and let you all know what i thought and here is my verdict. To tell you a bit more about the product it is an infused rapeseed oil which comes in a 100 ml bottle which is a good size easy to store. It really smells like lemongrass and lends itself very well to asian inspired dishes and for flavour and part oil substitute in vegan baking. Rapeseed oil has many perks such as being low in saturated fat, more rich in omega 3 than olive oil for example and has a burning point at 230 degrees celsius making it good for cooking and baking. 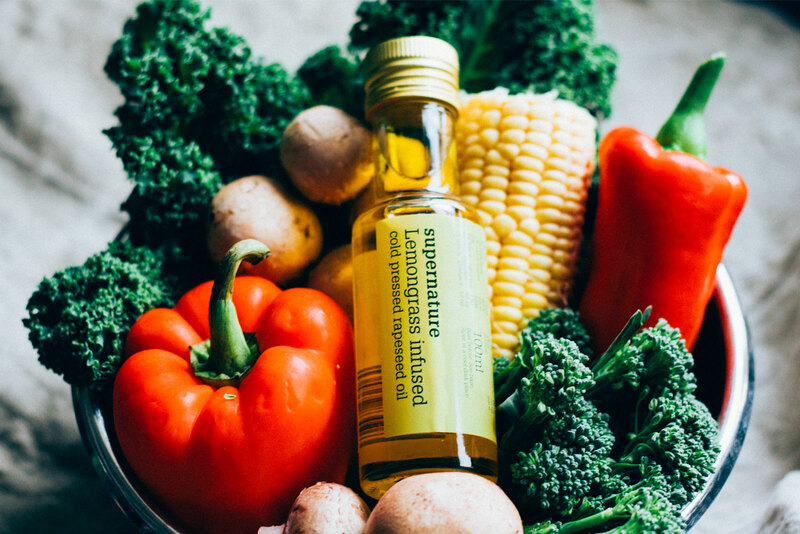 With a very palatable flavour in itself rapeseed oil can also be used for dressings, marinades and kale massaging which this lemongrass infused oil is fun for as it adds some flavour. Supernatures infused oils also come in lime, coriander and chilli which could all be fun for cooking and dressing foods. The ingredients listed are: cold pressed rapeseed oil and lemongrass oil. This sounds pretty innocent to me which is a good first impression, however this product is not organic which is something I usually look out for and use. The rapeseed oil is produced nearby, in Scotland at Carrington Barn Farms, which is a plus. And for the more vain analysis the packaging is nice as well as petite and I’d be happy to leave this product on the counter which helps in a kitchen as packed as mine. And it’s pretty reasonably priced for something a bit fun and different at £2.45. The taste test shows that uncooked the oil has a strong lemongrass flavour and as mention it is good for dressing salads and marinating for example tofu especially combined with spices like chilli, ginger or garlic. When using it in cooking and baking of course quantity will decide the potency in the dish but I think using a relatively small amount goes a long way with this product. See two of my recipes, one sweet and one savoury, using the oil below. When boiling add noodles and drain as instructed on packet. Place oil in wok pan on low heat and add sliced onion, ginger, garlic and chilli flakes. When fragrant and before any of the garlic burns add chopped capsicum and broccoli as well as a generous splash of tamari/liquid aminos. Turn heat up and fry for roughly 2-3 min whilst cleaning and halving mushrooms. Add corn kernels, kale and mushrooms and fry for roughly another 3-5 min. Add noodles when drained and the vegetables are tender. 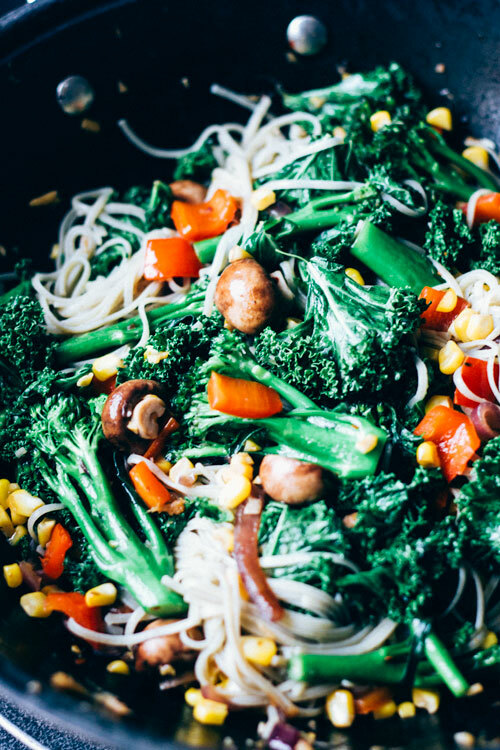 Add a splash of tamari/liquid aminos, combine noodles and veggies – serve! 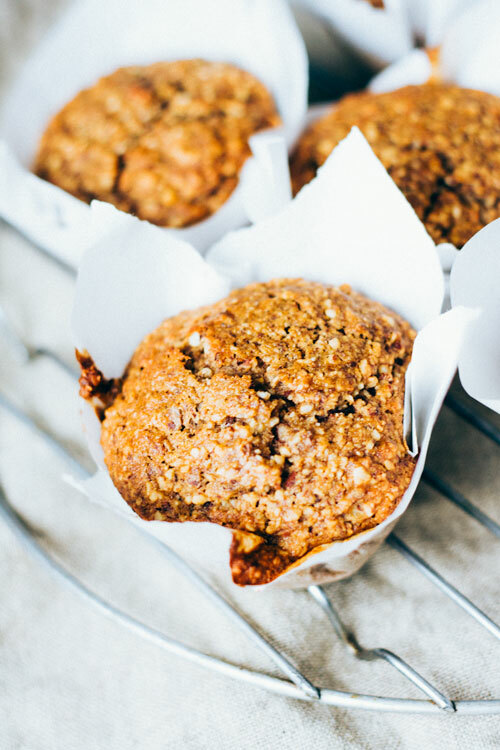 Line a muffin tray with baking paper or grease it. Combine all dry ingredients and spices, mix. Mush banana and mix with lemongrass infused oil, grated ginger and plant milk. Add flaxseed mixture and combine. Bake for roughly 20-25 min or until a toothpick comes out clean. Let cool for 15 min.